One of my 2015 goals is to host a watercolor party. Inspired by the Sip & Paint “movement” I thought it would be fun to invite a few friends over to paint. A way to share what I love to do. So, when I was visiting her beautiful new home on Saturday, I brought my painting supplies. I figured I could try things out and see if I ‘d even want to try it on a group of people. A few days before, I tried teaching my young niece and my immediate thought was, “I don’t want to do this.” But armed with what I learned from my experience with my niece (who had been very happy painting what she felt like) I had the framework of a plan. My niece wanted to paint what she wanted to paint. That is part of the challenge – how do you teach people and “control” what they are working on, so you can guide them, but also allow them to be free to follow their own inspiration? 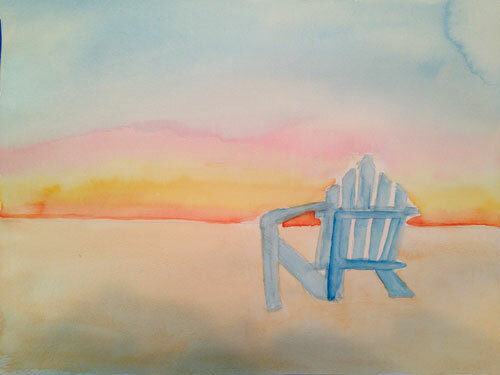 scrap paper – first I explained the fundamentals of watercolor and we practiced – wet on wet, wet on dry, dry on dry, etc. It is really funny how people, who don’t normally create, feel pressure with that blank piece of paper. Jen asked, “What should I paint?” I think she felt like she was being tested. I explained it was “scrap” paper and we were just learning. The object of this assignment is to start playing with watercolor without stressing about what it’s suppose to be. Jen drew a heart in the middle. I drew a starfish. We kept our shapes dry and wet the area all around it. We concentrated on creating interesting backgrounds. I worked along with her on my own painting showing her different things I do, so she could use any techniques she wanted to. We let the backgrounds dry before we painted the shape. final project – what do you want to paint? This picture of her painting doesn’t do it justice! It came out great. I was proud of her and I think she was proud too! P.S. Today she is online shopping for watercolor paints – wow. Categories: Watercolor | Tags: inspiration, painting, teaching, watercolor | Permalink. Major wow moment! : ))) You are a natural inspiring and motivating artist/teacher. That is an amazing gift – to be creative and to help others be too. Wow, impressive!! Congrats to you both! She’s a natural You’ve just opened a creative door for her. How lovely is that?! You are right! I need to check in and see if she has opened her new paints. We might need a part 2 to get her going!